Would you know what to do if you see a child choking on a piece of fruit? Or if you see your father passed out on the floor? At one point in our lives we have to take care of our loved ones whether it be children, parents or grand parents. EJHR Enterprises strives to give its clients the best training experience possible. 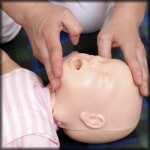 This is not your typical boring CPR class; we offer a fun, interactive learning experience. Each student will get to practice each skill taught in the class and will have more confidence on their ability to handle a real medical emergency. Each student will get their own individual mannequin to use in the class. Students are encouraged to ask questions in regards of their professional and personal concerns they have about medical emergencies and how the 911 emergency system works. Teachers and students alike share their personal experiences in class. Every person no matter who they are should learn CPR. We guarantee this will be the best CPR class you’ll ever take! We offer AED sales and support. We are now offering CNA prep classes. "Erik has been a huge relief for Kid’s Nite Out and our CPR/1st Aid training needs! He comes straight to our offices monthly and offers an affordable training class to our new employees, or those who need their certification updated. We will continue to use him for the sake of our employee’s convenience and their wallets! Thanks Erik!" I just wanted to thank you once again for a great class! All my staff really enjoyed themselves and learned so much. You have a way of making CPR and First Aid so much fun. We will definetively call you back for our next re-newals. Thanks! …Some of our highly qualified caregivers have received their CPR training through the knowledge and expertise of Erik Helms. He is always looking to be of service to our organization and is always available to meet our caregivers needs so we can provide our clients with the best care possible!